Thursday, January 17, 2019 ~ 10:30 a.m.
Wednesday, January 16, 2019 ~ 6:00 – 8:00 p.m.
Mervin H. Riecken, 80, of Ashland, NE, died Sunday, January 13, 2019 at his home in Ashland, NE. He was born November 29, 1938 in Elkhorn, NE to Leroy and Laura (Paasch) Riecken. Mervin attended District 48 country school until the 2nd grade and then went to Wann Elementary. He graduated from Ashland High School in 1956. On March 11, 1960, Mervin married Patsy Ann Hosch in Fremont, NE and they made their home in Fremont until they moved to Ashland in 1973. Mervin was a loving husband, proud father and grandfather and a farmer. Through the years, he worked at Kelly’s IGA Grocery Store as an assistant manager and Old Home Bread Company until he started farming full-time in 1973. 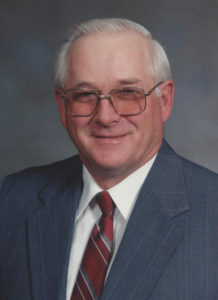 He also worked at Lyman Richey Sand & Gravel while farming. Mervin enjoyed playing baseball in his younger years and softball with the Wann Bombers. He also loved horses, hunting, fishing and bowling. He is survived by wife of 58 years, Patsy Riecken; sons, Scott (Rhonda) Riecken of Ashland, Mike (Niki) Riecken of Gretna and Matt (Ann) Riecken of Ashland; grandchildren, Charly (Patrick) Spangler, Serena (Justin) Hagedorn, Morgan Riecken, Kendall Riecken, Rayce Riecken, Michaela (Patrick) Mencke, Taylor Riecken, Brody Riecken and Dylan Riecken; great-grandchildren, Kasen Spangler Ruari Mencke and Emery Hagedorn; brother, Harlan (Cathy) Riecken; sister, Kathy Bowman. He was preceded in death by parents, Leroy and Laura Riecken. Pat and Family – Surely thinking of you and your family at this time. Hold close all the great memories. Hugs to you. So sorry for your loss, but he’s not hurting anymore. My heart goes out to you and the boys and their families. Thinking of you. As a member of the Wann Bombers softball team, Merv was always fun to be around and a true gentleman. Even though it has been 40 years since we played together on the team he was like part of the family. Thanking of you.